Both Touch Retouch and Snapheal use very clever methods to fill in areas of a photo where you've removed a tree or an unwelcome relative. 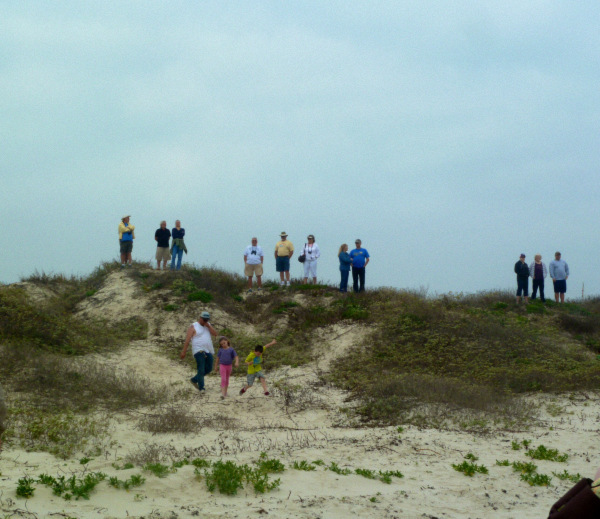 In the first photo, many others have joined me as I wait to take pictures of a wildlife release along the Texas shore. 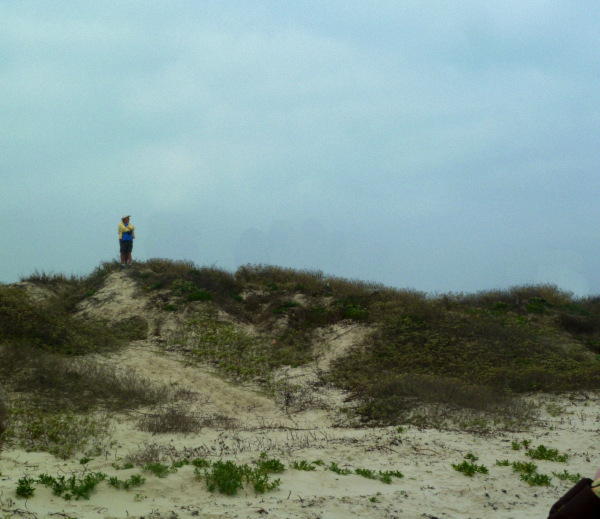 Using Snapheal Pro, in the second photo I removed all the others to make myself king of the hill. Notice how well the software took out the dad and his two kids at lower left. Each time Nancy and I teach a class on photo editing, we wow the crowd with a demo of Touch Retouch, a $.99 app for both Apple and Android devices. You can buy it from the Apple or Google app stores. This little app is like discovering a long-lost childhood toy at the dollar store. You feel all warm and fuzzy using it and you could play all day. Plus, you only paid a buck. Touch Retouch is a magic healing-and-cloning tool. Want that telephone line out of your photo? Zap. Need to take off Uncle Mort's hat in the picture by the lake? Zap. That No Parking sign sticking out of Gloria's head? Zappo. This sort of thing could hardly be easier. I use the iPad and Android versions for serious stuff, but I'll admit having an impish gleam each time I email a photo to my brother showing him driving MY truck or send off a picture of my dog chasing my dog. And now there's there's good news for Mac users who don't yet use an iPad: Touch Retouch is now available for the Mac. It works just like the iPad version but costs $9.99. Get it from the Mac App Store. Call it a double: I just came across a second super-heal-and-clone app for Macs. It's not cheap, but it's even more impressive than Touch Retouch. It's called Snapheal. There's a companion version called Snapheal Pro. Snapheal is $19.99. The Pro version is $39.99. Go to the Mac App Store for those, too. Both Touch Retouch and Snapheal use very clever methods to fill in areas of a photo where you've removed a tree or an unwelcome relative. Unlike simple cloning methods, the sophisticated techniques they employ can actually generate similar-looking textures and objects. With careful use, you're left with photos that seem magically transformed. Photoshop, the incredibly expensive professional photo software, has similar clone-and-heal capabilities. But there's little real advantage to the Photoshop method, and in all the demo editing I've done with Touch Retouch I've persuaded many Photoshop users that the little app does this kind of magic even better. You'll note an absence of Windows software here. Microsoft's fragmentation of Windows into standard Windows, toy-like Windows 8, oddball Windows RT and even Windows Phone versions, all different and all incompatible, has diluted the market badly, and I'd love to see this nonsense stop soon.